Someday we will look back on this phase and laugh. But right now, we REALLY just want this teething thing to be over. Until then, we have found that one product that has worked particularly well for Kuma during this difficult phase. Kuma. Loves. These. We’ve seen him sit and chew his for hours. These are 100% natural, made primarily with yak and cow milk. They contain no added chemicals, and most importantly….they last! They come in various sizes and flavors. If you’re looking for a treat that tastes great, is all natural, healthy, and lasts, you may want to try Himalayan Dog Chews. Kuma approves! The awesome unpublished “secret” about what to do with remnant stubs: zap it for a few seconds in the microwave, and it’ll expand and become porous like a giant cheese puff. Then it can be safely finished without becoming a major choking hazard! It’s explained in my entry for today. =) Happy new year! 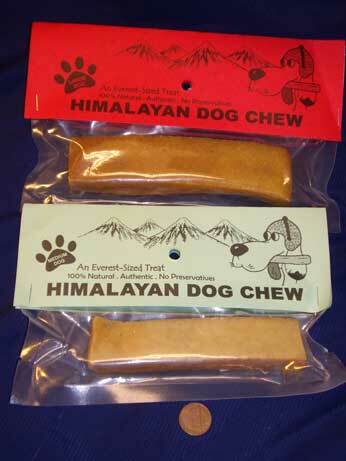 Thanks for the Himalayan chew insight, we were throwing the stubs away. And WOW!, thanks for nominating us!! We are honored!